Sunday night, we had fish pie. Think firm white fish (we went with cod and tilapia this time), cooked in a creamy roux, added some peas, topped with a layer of sliced boiled eggs, and then topped again with mashed potatoes and grated cheddar cheese. Bake it in the oven for 20 minutes or so, until the top is crispy and browned (we used the broiler to give it an extra oomph of crispiness) and voila! Dinner was done. It is a supremely delicious and comforting British dish. Here’s the recipe, courtesy of Nigella Lawson. Peel the potatoes and cut them in half or quarters, depending on size, and put them in a pan of salted water to cook from cold. When they’re tender, drain and then mash them with 3/4 stick of the butter, seasoning to taste. Put the fish into a large skillet with the milk, bay leaves and peppercorns. Bring the milk in the pan to a boil, then immediately turn down and simmer the fish until it is just cooked through. Remove the fish to a plate and pour the cooking liquid into a glass measuring cup, straining out the bay leaves and peppercorns. Meanwhile, put the frozen peas in a bowl, pour over some boiling water and preheat the oven to 375°F, slipping in a baking sheet as you do so. Melt the remaining 3/4 stick butter in a saucepan and stir in the flour to make a roux. Take this off the heat briefly, just while you gradually whisk in the fishy milk, then put back over a medium heat and keep stirring until the sauce comes to a boil and thickens. Let it bubble away for a couple of minutes and then take off the heat and stir in most of the cheese (leaving some to sprinkle over the top of the pie later) and the drained peas. Flake the fish, making sure not to let it disintegrate too much, and use it to line a 12-cup ovenproof dish and pour the sauce over, using a rubber spatula to help you distribute it equally and meld it with the fish. Cut the hard-boiled eggs into slices and arrange the golden-centered discs over the top of the fish in sauce. Top with the mashed potato, using a spatula, again, to help you coax it right over the sides. With a fork, scrape lines up and down the length of the dish and then sprinkle with a little grated Cheddar cheese before putting it on the sheet in the oven for 20–40 minutes, depending on whether you’re putting the pie in hot or cold. 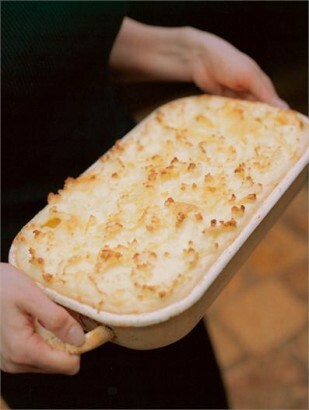 Posted on 3, April 2012, in Food and tagged fish pie, food, Nigella Lawson, recipe. Bookmark the permalink. 1 Comment. Seeing this made me fancy a fish pie! I used monkfish, haddock and prawns. Delicious!